Ali Zafar to star in a Pakistani Film! 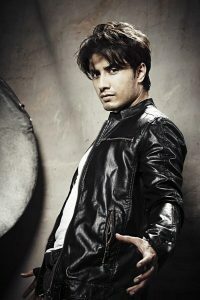 Ali Zafar who needs no introduction started out on local TV, then also established a career in Bollywood and his success led many Pakistani actors to venture into Bollywood films.He made is debut in Bollywood with film Tere Bin Laden and was nominated for Filmfare Best Male Debut Award.The Singer has now finally signed a local Pakistani Film which is all set to go on floors in early 2017. Images: Tell us a little bit about your role in Ahsan Rahim’s next, which is the first Pakistani film you’ve signed. What made you finally take the plunge and do a local film? Ali Zafar (AZ): I’ve been working towards making a film in the local industry for the last four years. Various subjects, stories and ideas were discussed and developed. And finally our excitement levels skyrocketed on this particular [story] and how it developed. Ahsan and I have worked very closely and look forward to this hitting the floors for filming come early 2017. I wanted my first Pakistani film to appeal to the dance -party walas and the rickshaw walas alike — a film for everyone. I can’t share much about my specific role as yet. All I can say is… well, nothing for now! It’s a surprise. Images: Ahsan has shared that it’s an action comedy. How will you be preparing for the role? AZ: You can definitely expect a lot of action and comedy from me till the film releases. [I’m] completely immersing myself into the character. Images: You’ve done a number of Bollywood movies. Share how Dear Zindagi was different and give us some insight into what it was like working with the cast. AZ: You don’t really get to see many films that are so simple yet so fascinating. I found this to be one of them. The characters are real and so are the emotions. I found it to be something people would be able to relate to in the real sense, especially younger audiences. Modern storytelling has and should continue to change and I think Dear Zindagi reflects that freshness in the art of storytelling. I also loved how my character was written. Not to mention he was named after one of my favorite poets, Rumi. Images: You were set to star in your own production, Deosai that has now been shelved. Why did you decide to abandon the project? AZ: It hasn’t been shelved but rather to be looked at for a later time. It just became too ambitious a film for its expense and too elaborate for the dynamics of our current industry as it required a lot of technical paraphernalia to go and shoot at impossible heights. I also happened to incur an injury in the preparation process. Meanwhile, my current film with Ahsan Rahim developed as a much more doable and an exciting venture with the perfect fun, feel good script with which to start this journey. I have a passion for positivity, fun, romance and laughter and this film is the perfect reflection of these facets. Images: Give us an update on your music. Do you have an album in the pipeline or has acting taken priority for the moment? AZ: Yes, I am also working on my fourth music album. Music will always remain my most intense passion and I am glad I get to keep the passion alive and burning in my movies. Dear Zindagi, for example, has me sing and perform two songs that I love. I hope you like them too. Images: Your thoughts on the progress of the current film industry? AZ: I think it’s great to see so many people venturing into film and to see different styles of films under production. Our strength lies in our versatility and diversity. Although we are still at a nascent stage where we need a lot more content to keep our cinemas running, our country is full of talented people just wanting an outlet to put their talent to use and skill set to polish. They should be given a chance and provided with all the support and infrastructure they need to create, write, direct, produce and act. This is my goal for the future and should be a common goal. Also the culture of being positive and progressive needs to flourish rather than bringing each other down. We should help and support each other. Learn from each other, discuss ideas and build an industry based on professional and sustainable work ethics so one day the world awaits to see what does Pakistan has to offer next. And we can only do this together.